An EnCase user contacted me about a problem he was having searching for a fairly common keyword and how he could exclude certain preceding or proceeding words that were adjacent to the core keyword. 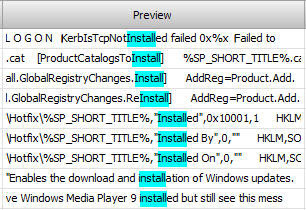 This would find the keyword "install" as long as there was no preceding "t" character before it. This example would eliminate the term clientinstall" as I indicated above, but it would also eliminate all other possible keyword hits that may have the letter "t" preceding the keyword of "install", such as "statinstall", which I may want. So to get around this scenario, I wrote an EnScript that asks for a keyword. It then also asks for a list of exclusion words (it can be pasted into the window). The EnScript then search ALL SELECTED items for ANSI and UNICODE occurrences of the keyword. It then reads the characters before and after the keyword hit to see if the hit is one of the exclusions you provided, if so, it skips the hit and moves on to the next hit. If the characters before and after do not match what you provided in the exclusion list, then it will bookmark it. This is a beta version and it has not been tested completely. Please feel free to download and try and post any comments, bugs, suggestions.